The Greens NSW spokesperson said today that Deputy Premier Andrew Stoner was not fit to lead the National Party and should resign after a dismal performance at Budget Estimates Committee hearings today where he did not know the number one agricultural commodity in NSW, had no knowledge of his government’s support for the biggest water buyback in Australian history and re-wrote the history of the Nationals’ position on mining and agriculture. 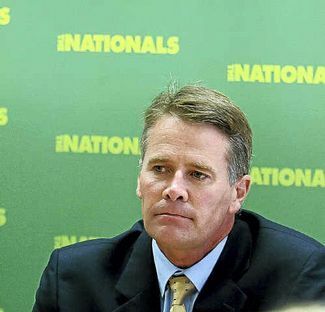 “It’s unbelievable that the leader of the National Party would not know what the number one agricultural commodity was in NSW, but Mr Stoner had to “take a stab in the dark”, guessing wheat,” said Greens MP Jeremy Buckingham. When asked about the proposed Nimmie Caira water buy back on the Murrumbidgee River, the biggest in Australian history, the Leader of the Nationals admitted he did not know anything about it, despite it being supported by his government. When asked about the Nationals election commitment that ‘agricultural land and other sensitive areas exist in NSW where mining and coal seam gas extraction should not occur’ Mr Stoner claimed the Nationals election commitment was for ‘coexistence’ of mining and agriculture. Mr Stoner could not explain how government’s land use ‘gateway’ process functioned asserting that mining and gas development could be ‘stopped’, despite the policy explicitly stating that a gateway certificate or conditional gateway certificate must be issued. Mr Stoner revealed that he had met with officials from Chinese coal giant Shenhua in China (Liverpool Plains coal mine proposal) and steel maker POSCO (Southern Highlands coal mine proposal) in South Korea. Mr Stoner also said landholders that were locking their gate “may be a case of cutting off their noses to spite their face”. Jeremy Buckingham said: “Andrew Stoner is too busy meeting with foreign coal companies and dining out at high end restaurants to know what should be the bare basics for any leader of the National Party. “Mr Stoner is clearly not up to the job and should make way for someone who actually knows and cares about country NSW,” he said.